NC Gardens & Beach Resort is nestled in a small cove on the Malabar coast of Kerala set amidst a lush green coconut grove with tall coconut palms sashaying to the tune of salty breeze from the Arabian Sea. A pristine stretch of virgin beach stretches long and is a splendid retreat for sea worshippers. The palm fringed beach outlines 15 acres of lush green coconut plantation complete with traditional cottages that makes you feel worlds away from reality. In the morning wake up to the birdsong of a stupendous variety of multihued birds. The magical beach beckons you to fun 'n frolic in the blue waters. One can swim in the shallow blue water or have a sunbath in the exotic tropical sun. At the end of your holiday a healthy suntan can make you the envy of your friends. The Evening sun paints the earth, sky and glistening waters to a tantalizing hue of crimson and makes you wish you could make that moment last longer. And when night falls, retire to your cozy, cottages and enjoy the bounty of nature in solitude, peace and quiet. 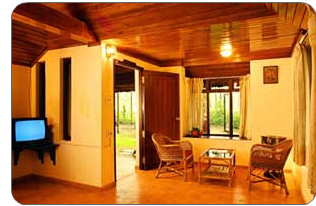 The luxurious accommodation offers the comfort and convenience of home in a beautiful setting. The accommodation is set nestled amidst 15 secluded acres of beachfront tropical gardens and a very private 3/4-mile white-sand beach. 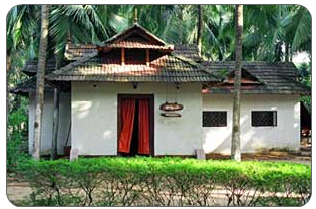 They have 3 spacious cottages and 4 inter-connected rooms built in tune with Kerala tradition offering a captivating view of the sea and are equipped with all modern amenities. 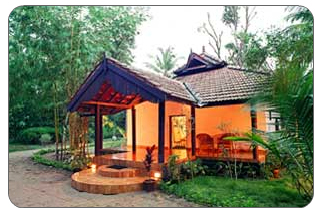 Panampillynagar, Cochin, Pin 682 036.